Many people think the only time they have to make an appointment with their dentist is when they have a cavity or a loose tooth. In fact, if you get a loose tooth as an adult, you should have seen a dentist a long time ago. But aside from cavities, there are other reasons you should make an appointment to see your dentist. We generally recommend you see your dentist every six months to get a professional cleaning, and while the cleaning can go a long way towards keeping your mouth healthy, it’s only one reason we recommend maintaining regular appointments to see your dentist. 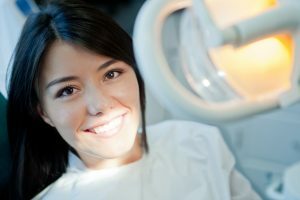 The other reason is that, along with giving your teeth a good, deep clean, your dentist will also check for cavities, gum disease, and even signs of oral cancer, so you should definitely make sure you see your dentist every six months in order to stay on top of those potential health hazards. Speaking of gum disease, it’s another reason you should see your dentist. Gum disease can be caused by a variety of oral health maladies, including cavities, infection, and dry mouth. It could be as simple as a failure to properly brush every day, or it could be a sign of something much more serious. Few people realize that the mouth can act as a sort of window into the rest of the body, so any time you experience any significant changes in your mouth, you should see your dentist right away. It might be nothing, but it has the potential to be something very serious. Dry mouth is another symptom of ill health that, initially, might seem like it’s nothing more than an annoyance, but it could be a sign of a much deeper issue – or it could even cause a more serious issue. Many medications can cause dry mouth as a side effect, and dry mouth, in turn, can cause other problems, such as cavities and gum disease. The saliva in your mouth helps rinse away sugar and food particles, in addition to protecting your mouth against harmful bacteria. Take away the saliva, and you also lose that protection, so if you’ve been feeling like you just can’t get enough water to lose that dry feeling in your mouth lately, you should see your dentist right away. Along with all the other changes pregnancy brings are changes to your oral health. Those changes can lead to an increase in symptoms like dry mouth or cavities if you’re not careful, so be sure to check in with your dentist and let them know you’re pregnant so they can advise you on the best course of action when it comes to taking care of your mouth while you’re carrying the newest addition to your family. If you have any jaw pain while chewing and/or swallowing, the issue could be with your neck or jaw, or it could be something your dentist can help you manage, so be sure to talk to them any time you experience a change in your ability to chew or swallow.